We are pleased to announce the HiPEAC industrial PhD internships in 2012. Any PhD student who is a member of or affiliated with a Hipeac institution in Europe is eligible for these internships. The internship opportunities are provided by the Hipeac member companies in Europe. The duration of the Hipeac-funded internships is 4 months but companies are free to extend the internships at their cost beyond 4 months. The internships have to start and complete in 2012 (you will need to negotiate your start time with the company). The details of the Hipeac internship funding scheme (e.g. how much is the pay and what is covered and so on) can be found here. As of today, there are 28 internships from 10 different companies. You can see all the internships here, and apply by clicking on each internship title. Through the Looking Glass: Trend Tracking for ISSCC 2012 is an article in IEEE Solid-State Circuits Magazine March 2012. It beautifully puts together the latest trends in academia and industry. Are you still using the old figures in your presentation? It is time to update them. This Parallel Book heavily uses Intel’s Cilk and Thread Building Block model as examples. Yet it is generic enough to apply their patterns in other programming models, e.g. OpenCL. The algorithmic patterns used in the book are summarized in their SuperComputing 2011 turorial (PDF). The Xilinx Kintex-7 FPGA KC705 Evaluation Kit is now available for order, at the price of $1690, with 5 week factory lead time. The Xilinx Virtex-7 FPGA VC707 Evaluation Kit, at the price of $3495, is going to be available at avnet. Recently, a new CUDA book was released titled: CUDA Application Design and Development. Embedded GPUs programmable in OpenCL or CUDA are slowly starting to become available. First of all, there is the new CUDA on ARM dev-kit, which is named ‘CARMA’. The board contains a Tegra 3 quad-core ARM and a Quadro 1000M Fermi GPU with 96 CUDA cores. The GPU is programmable in OpenCL and CUDA. Details are found on their website. The dev-kit is expected to be available in Q2 2012. Second, there is a new version of the ZiiLABS ZMS board, the ZMS-40. This is a system on chip with a quad-core ARM and a 96 SIMD cores. 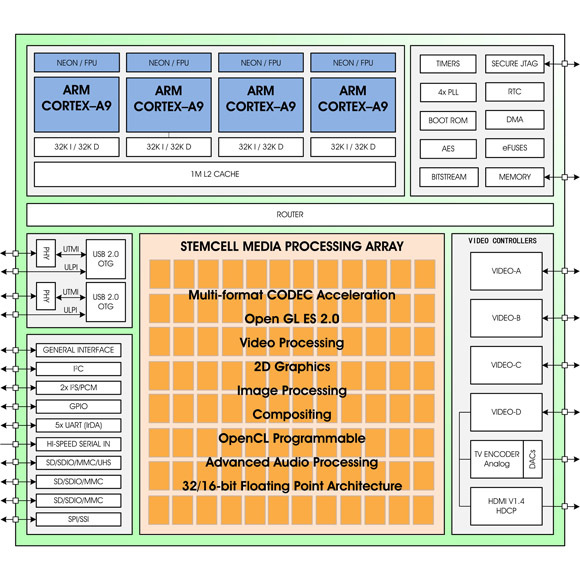 The SIMD cores are programmable with OpenCL. More information can be found on the ZiiLABS website. The ZMS-40 SoC is available in a tablet running Android ICS.